Oh, you have the best will in the world and make plans and I would have to say for once sickness, not procrastination, has beaten me! I have joined in the Swoon Quilt Along and have finished my first block. I found 16 FQ's in my stash and some yardage to make up the last 2. Having used white and cream for the negative space before, I fancied a change and went for light grey which I picked up from the local fabric shop. 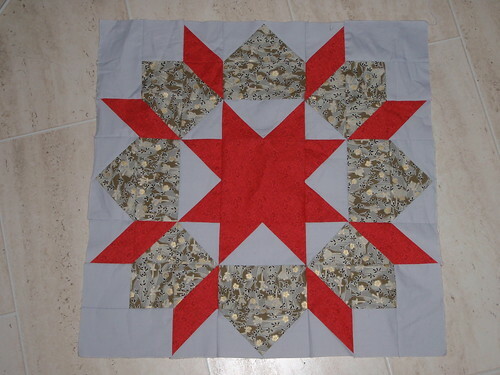 I've not make a single block so big before and I love the grey. Well I cut out the second block and then was struck by some nasty virus. I'm still fighting it - I don't do sitting still well! So hopefully there will be another photo next week. Feel free to join in the fun and thanks to Katy for setting the group up.